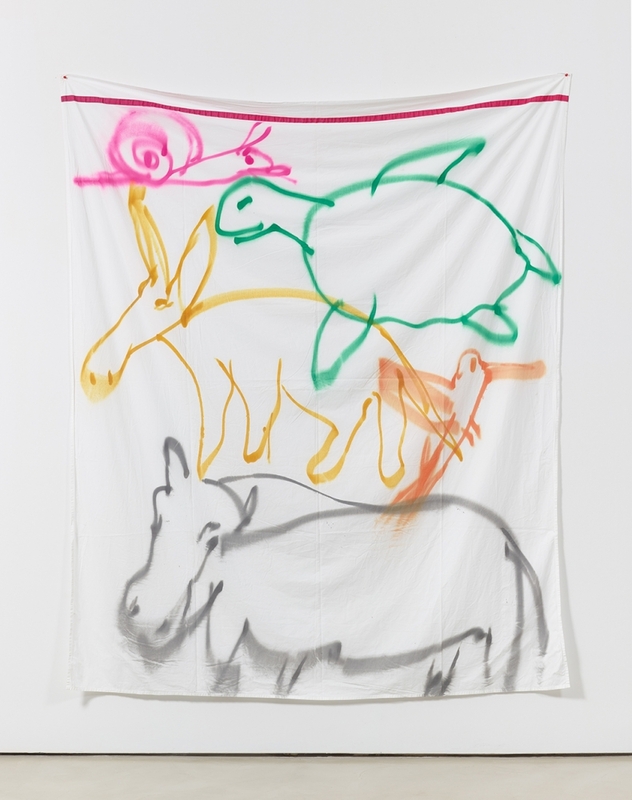 Put Me In the Zoo is a group exhibition titled in reference to Dr Seuss book – it brings together five artists who draw inspiration from Nature and the representation of animals and open their work to the wide range of questions associated with the predicament and reality of wildlife. The exhibition is organized by painters Ann Pibal and Suzanne McClelland who have an abstract practice far remote from the representation of natural life. The work of Ann Pibal engages the history of abstraction and constructivism. The small scale of her paintings on aluminum can assert a feminist stance against male appropriation of abstraction. Pibal explores phenomenons linked to synesthesia where lines and color lead to secondary cognitive pathways. In a different approach but also rooted in the questioning of systems of signification and sensory exchanges, Suzanne McClelland transcribe spoken words into visual riddles. She occupies a unique place within the tradition of language in art as her painting are taking into account intonation, verbal idioms, accent and all the modulations of the spoken word in a stark contrast to the written word. The proposition for Lucien Terras. results from an ongoing discussion between two artists deeply curious about forms of expressions that contrast and challenge their own practice. Their proposition – a more adept description than “exhibition curated by” – combines wit and gravitas and gathers animals of all sorts (leopard, turtle, butterfly, snail, sheep among others). A curious zoo at a curious time, when the continued existence of wildlife is under constant threat of the specter of extinction.